The General Osteopathic Association is the government, independent regulator for osteopathy in the UK. 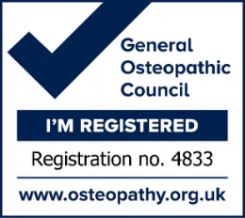 All our osteopaths are registered with the GOSC. This site has more information on osteopathy and osteopaths. The iO is the UK’s professional membership organisation for registered Osteopaths. The purpose of the institute is to unite, promote, develop and support the Osteopathic profession, to improve public health and patient care. The Osteopathic Sports Care association is a membership group of osteopaths involved and interested in the treatment of people participating in sport. This site has more information on osteopathy and osteopaths involved in sport. The Osteopathic – Pelvic, Respiratory and Abdominal Association is a membership group of osteopaths who are involved and interested in pelvic, respiratory and abdominal applications of osteopathy. This site has more information on osteopathy and osteopaths. The Perrin Clinic leading the world in the osteopathic diagnosis and treatment of CFS/ME. This site has more information on the Perrin Technique, CFS/ME and osteopathy.